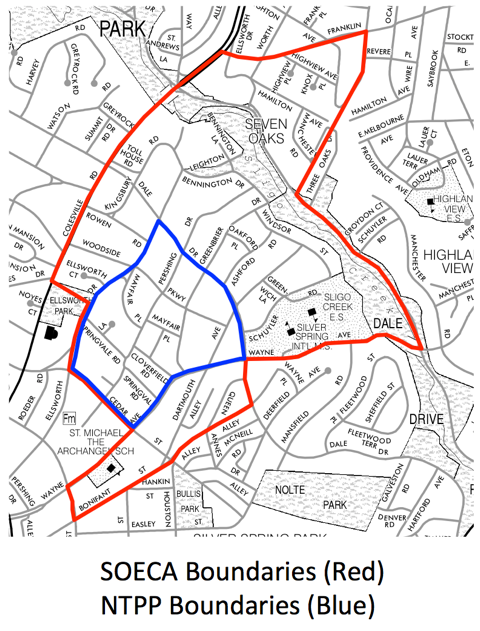 As a response to increased cut through traffic in the section of SOECA between Dale Drive and Cedar Street in the 1990s, SOECA worked with the County Department of Transportation to develop a Neighborhood Traffic Protection Plan (NTPP). The plan took months of collaboration and compromise to design. Another two years were spent collecting signatures in support of the plan from a required 2/3 of the households within the plan’s boundaries (Cedar, Colesville, Wayne, and Dale). The result was a Montgomery County Executive Regulation detailing the traffic restrictions that would be put in place to protect the area from cut through traffic and the steps that would be taken to enforce the plan. The manifestation of our neighbors’ work is the “one way” and other traffic restriction signs at neighborhood access points on Colesville Road, Wayne Avenue, and Cedar Street. Residents, children, dog walkers, and cyclists enjoy safer streets, reduced noise and air pollution, and infrequent cut through traffic as a direct result of the NTPP. To see a map of the areas of SOECA covered by the NTPP follow this link. To see the official County documents establishing the Seven Oaks Traffic Plan follow this link. ● We led an effort to install speed tables on Sligo Creek Parkway between University Boulevard and Wayne Avenue. ● We succeeded in getting a three way stop sign installed at Sligo Creek Parkway and Schuyler Street – a key crossing for students and other residents. ● We lobbied for a painted crosswalk and pedestrian crossing signs at Worth Avenue and Sligo Creek Parkway. ● We worked to have sidewalks installed on Dale Drive to provide a safe route to Sligo Creek Elementary and Silver Spring International Middle Schools. ● We worked with County traffic engineers to install traffic calming measures the length of Dale Drive between Colesville Road and Wayne Avenue. SOECA has a vibrant walking and biking community for adults and children. As a result of our efforts, safety for children walking to Sligo Creek Elementary School and Silver Spring International Middle School has increased greatly. For a summary of pedestrian laws in Montgomery County follow this link.